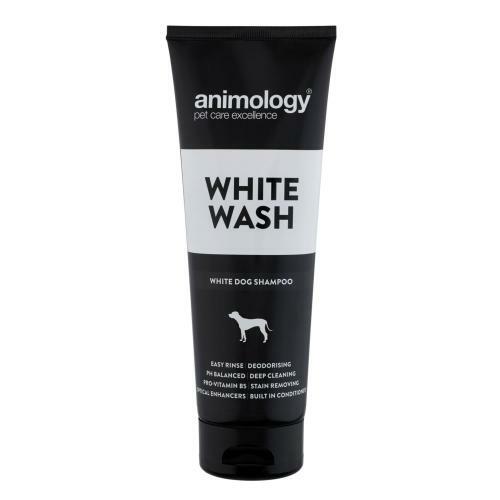 Animology White Wash Dog Shampoo is specially formulated for dogs with white hair. Providing dazzling results, White Wash contains optical whitening enhancers and offers a mild yet deep cleaning action that removes dirt, odour and yellow staining without stripping essential oils out of the coat. Featuring Animology ‘Easy Rinse’ technology this keeps washing time to a minimum (great for difficult dogs) and contains built in conditioners & pro-vitamin B5, helping to improve the health, strength and quality of the coat. Animology White Wash leaves your pooch feeling and smelling fabulous.